Prefer to call? You can reach us at (970) 686-7297 to place your order. 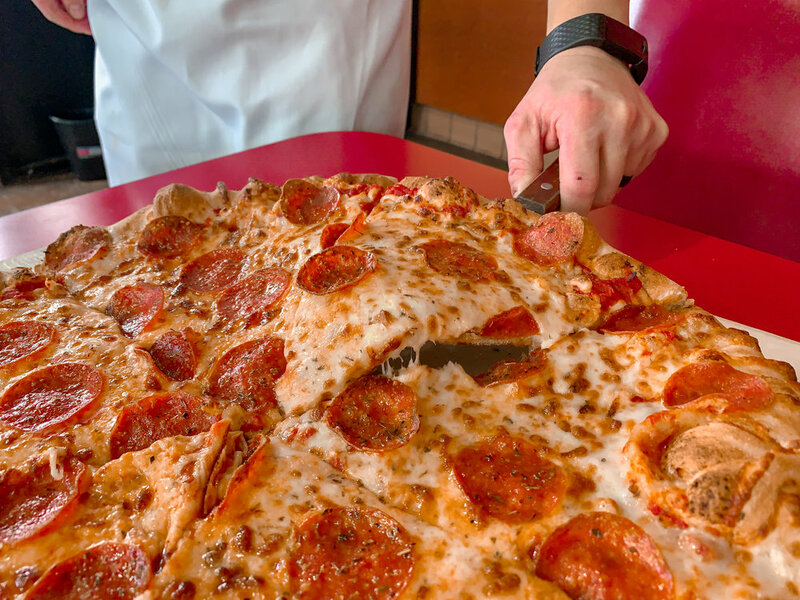 Located in Windsor, Pelican Jo’s is bringing New York style pizza to Northern Colorado. It’s no accident that Pelican Jo’s Pizzeria is a beloved part of the Windsor community. Every pizza we serve starts with our special dough recipe and is hand stretched to order. Each salad or sandwich is crafted from crisp produce and freshly carved meats. We even offer gluten-free pizzas, sandwiches, and desserts. But what’s most important to us is you. Our legendary customer service is at the core of our company culture, and we pride ourselves on building guest loyalty. We’re honored to have received the 2012, 2013, 2014, 2015, 2016, 2017 and 2018 Best of Windsor—Best Pizza Award. Thank you for giving us the opportunity to be a part of the community we serve! Founded in 2008, Pelican Jo’s is the end product of the dreams of Mike and Jodi Brady. After meeting in Colorado Springs, their careers took their family out east where they raised their three kids. Once the kids became adults, the Brady bunch all migrated back to the Rocky Mountain State. Family, friends, and beautiful mountains…what could be missing? Answer: East coast style pizza. Mike decided to bring unique New York style pizza, served with a side of friendly customer service, to Northern Colorado. Now, years later, this family dream has been shared with a second generation. Their youngest son, Kyle, and his wife Lindsey have joined as part owners and operators of Pelican Jo’s. Together, they are committed to the community of Windsor and to you, the customer. Homemade pizza crust topped with mozzarella and Parmesan cheese. Served with your choice of marinara sauce or Ranch dressing. Homemade dough baked into a knot, topped with butter and garlic. Homemade creamy spinach artichoke, served with garlic knots on the side. Pepperoni, mozzarella and oregano rolled up in our homemade dough, topped with butter and garlic. Six of our mouth-watering pizza rolls. Your choice of barbecue sauce, blue cheese dressing, homemade ranch dressing, mango habanero sauce, or marinara sauce. Your choice of Nacho Cheese Doritos, Sour Cream and Onion Lay's, or Lay's Original Potato chips. Fresh garden greens tossed with tomato, red onion, cucumbers, and choice of dressing. Fresh garden greens tossed with tomato, red onion, cucumbers, Kalamata olives, and Jo's Italian dressing. Our house salad smothered with pepperoni, salami, provolone cheese, and Jo's Mediterranean relish—a mix of olives, artichoke, red pepper, and banana pepper. Smaller portion of the Pelican Jo's House Salad. Oven baked, served with your choice of sauce and dressing on the side. Our famous spinach artichoke spread, tender chicken breast, mozzarella cheese, real bacon, Alfredo sauce, and Parmesan. Chicken in mango habanero sauce and pineapple. Pepperoni, pineapple, jalapeño, feta cheese, an incredible flavor balance. Pepperoni, bacon, sausage, and Canadian bacon. Onions, peppers, mushrooms and Jo's Mediterranean relish (for olive lovers). Canadian bacon, pineapple, jalapeños, topped off with a tangy mango habanero sauce. Cream cheese, bacon, and jalapeños. Chicken, bacon, Ranch, and fresh diced tomatoes. Beef, garlic, green pepper, red onion, and cheddar. 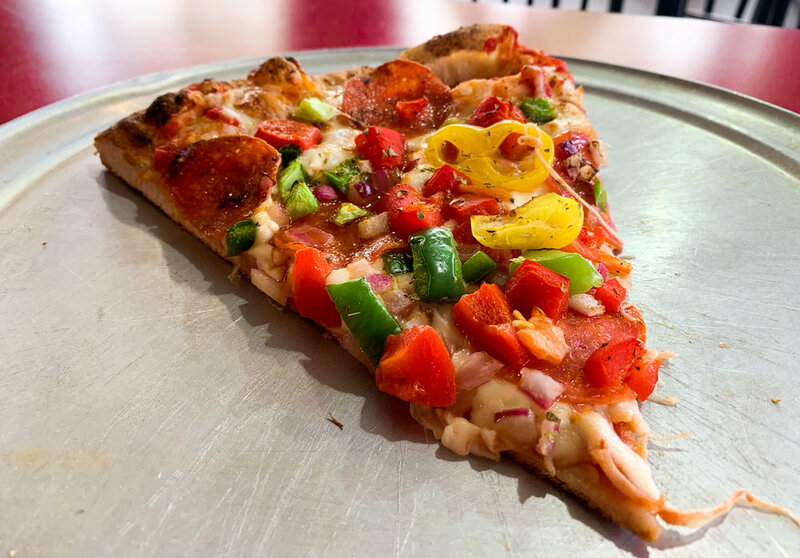 Our version of a supreme that includes pepperoni, sausage, Canadian bacon, mushrooms, green pepper and red onion. Garlic, white sauce, roast beef, diced red onion and green pepper. Tangy BBQ sauce, chopped chicken breast, chopped bacon, and sweet onion. All pizzas can be made on an 8" gluten free crust upon request. Black olive, mushroom, green pepper, jalapenos, pineapple, red onion, fresh tomatoes, pepperoni, sausage, Canadian bacon, ground beef. Start with a cheese calzone for 6.99 and add any regular topping for 1.00 or any premium topping for 1.25. Turn any signature pizza into a calzone for 9.99. Ham, salami, pepperoni, Parmesan, provolone, homemade Italian dressing, lettuce, tomato, and onion. Salami, pepperoni, lettuce, tomato, onion, Jo's relish, pesto and provolone cheese. Jo's meatballs, sauce, red onion, and melted provolone cheese. Tender roast beef with sauteed onion and peppers, smothered with provolone cheese. White meat turkey with provolone, lettuce, tomato, onion, and spinach artichoke dip. Delicious vanilla dessert bar with subtle hints of brown sugar. New York style-cheesecake, baked from scratch.